Taking capsules or pills allows us to know just how much we’re getting — and they’re easy to swallow. That’s why we offer this form of CBD to our customers. Discover our CBD capsules in our Raw Hemp and Decarb CBD oil ranges. 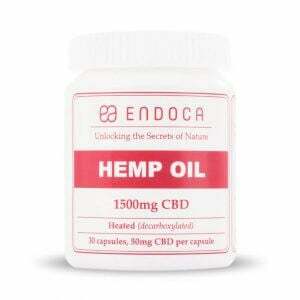 Here at Endoca, we believe it’s important to offer as many options as possible to administer CBD. Most of us have grown up in a world where medication is given in pill form so we know exactly how many milligrams of the active ingredient they contain. So why not include CBD pills within our range of products? An added benefit is that you don’t have to experience that hemp taste if you don’t want to. What are the benefits of CBD capsules and pills? We love the taste of hemp, but we understand not everyone feels the same way. This is why we’ve introduced our capsules and CBD tablets range with no hemp taste. Instead, we use vegan gel caps that are completely gluten-free and kosher. Inside each of our CBD hemp oil capsules is our thick and waxy hemp extract. Extracted from our organic hemp plants using the state-of-the-art Supercritical CO2 method, it then goes through a gentle cold filtration process. The result is CBD Extract in its most complete form with nothing added or taken away. When you need to take your CBD, you just pop a capsule in your mouth like any other vitamin or supplement. There’s no need to calculate dosage per drop as this is already calculated for you. Simply swallow down and you’re done. It’s important to know, however, that when you take it this way, your body absorbs less of the main active ingredients, as the CBD extract must first pass through your digestive tract and be broken down by liver enzymes. This means that less CBD enters the bloodstream compared to other delivery methods. 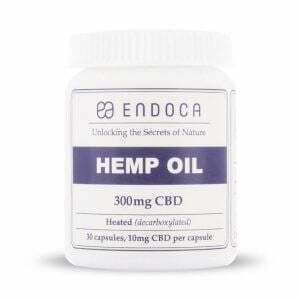 It also means it can take up to an hour for the CBD hemp oil pills to take effect. Yet, for most people, the advantages slow release are enough to warrant making CBD tablets and capsules their favourite way to take CBD extracts. We have both Raw Hemp Oil Capsules and CBD Capsules for sale. 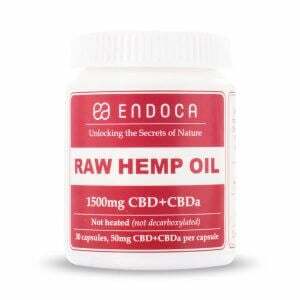 Raw Hemp Oil capsules contain CBDa, CBD’s acidic precursor. If you examine any hemp plant before it’s been dried, you’ll find it contains almost exclusively CBDa and very little CBD. This is because CBDa converts into CBD when continued heat is applied. This is known as the decarboxylation process. 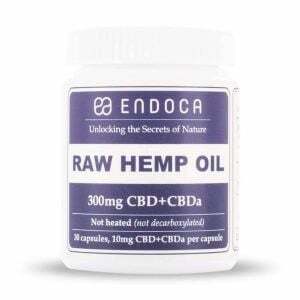 As well as CBDa, our Raw Hemp Oil capsules also contain CBD along with other minor cannabinoids and terpenes, which are better preserved when they haven’t been through the heat process. CBD capsules contain more than just CBD. They are also considered whole plant extracts — but they don’t contain the raw version of the plant. In the end, choosing Raw Hemp or Decarb CBD Capsules is a personal choice, with customers often trying out both forms to see what works out best for them. 1500mg (with 50mg of either CBD or CBD/CBDa in each capsule). People react differently to CBD, so most people start with a low dose. Depending on the effect, you can increase to the stronger CBD Capsules. Whichever form you decide, it’s always a good idea to take CBD Capsules on an empty stomach. While CBD Capsules are useful to take on-the-go, it’s important to remember that our Raw Hemp Oil Capsules should be stored in the fridge. This is because if left in a warm environment, the CBDa may convert into CBD.